You’ve heard about the magical bond that twins share – but how many parents get to witness it before they are even born? When proud parents-to-be, Carissa Gill and and her boyfriend Randy went along for a routine ultrasound for their twin pregnancy, they didn’t expect this amazing result! 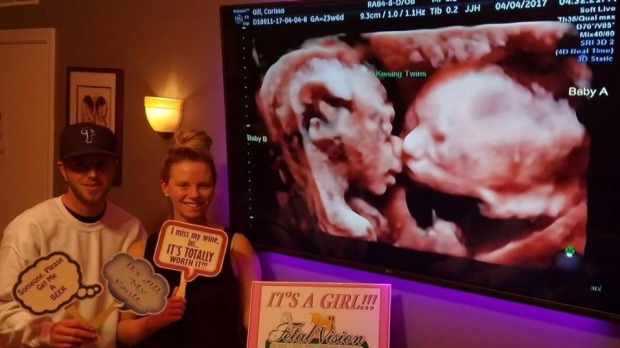 The lucky couple got to witness something very special in their 4D ultrasound, as their precious baby girls put on a glorious display for the cameras, cuddling up to each other and ‘kissing’ repeatedly throughout the scan. Carissa, who is 25 weeks pregnant, shared the astounding image on Instagram with the caption: “If only I was @beyonce and this photo would go viral in seconds”… well, she got her wish! The photo has been liked over 3,000 times in the five days since it was posted. Sadly, while most of the comments have been supportive and kind, Carissa reveals that she has received some negative feedback about her photos. Honestly, don’t people have anything better to do than leave nasty comments on a mum’s gorgeous photo? Sometimes it seems that people completely forget their manners when commenting on something they see online. Glad to see Carissa is rising above the negativity and enjoying her pregnancy regardless. Go mama! We wish Carissa and Randy all the best with the rest of their pregnancy. What a great story and beautiful photos they’ll have to share with their girls when they are a little older.